A good amount of vegetables every day is important. 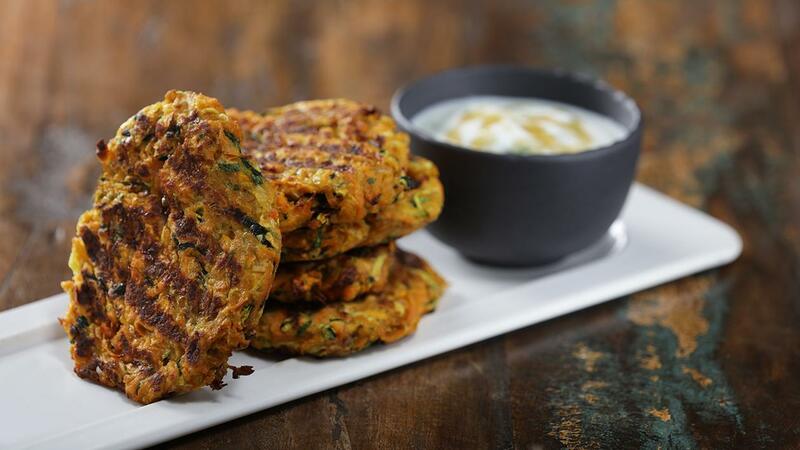 These fritters have five tasty vegetables in and are grilled or baked to keep them healthy this Ramadan. Served with a yogurt, mint and honey dressing. Combine all the ingredients except honey, use the honey to drizzle on top of the dressing before serving. Place the shredded zucchini, sweet potato, and onion in a large strainer. Top with 1 teaspoon salt and mix. Press down with your hands to begin draining some of the water from the vegetables. Let that sit in the sink for a few minutes. You need to get out as much liquid as possible. Note: You can also simply wring out the vegetables in the dish towel over the sink. Just keep wringing! Let the vegetables sit in the towelsfor 45 minutes, then press again.The goal is to remove as much moisture as possible. Otherwise, the fritters will be soggy. Whisk the eggs together in a large bowl. Once beaten, whisk in the garlic, Knorr Chicken Stock Powder, parsley, mint, remaining 1/2 teaspoon salt, and pepper. Fold inthe vegetables, then add the cornmeal and cornstarch until everything is combined. Heat the oil in a skillet over medium-high heat. Shape fritters into 50-80g shapes. Cook until golden brown, about 3 minutes on each side. Transfer to a paper towel lined plate until finished. Serve warm fritters with yogurt sauce.